The Roos Family Turns Lemons into Hope! Two weekends ago my two girls (Ashley in the red, Lexi in the hat) decided to hold our somewhat annual Roos Lemonade​ Stand to raise money for charity. This year Ashley suggested we raise the money for Plan Canada Gifts of Hope program that provides assistance to families in Africa. 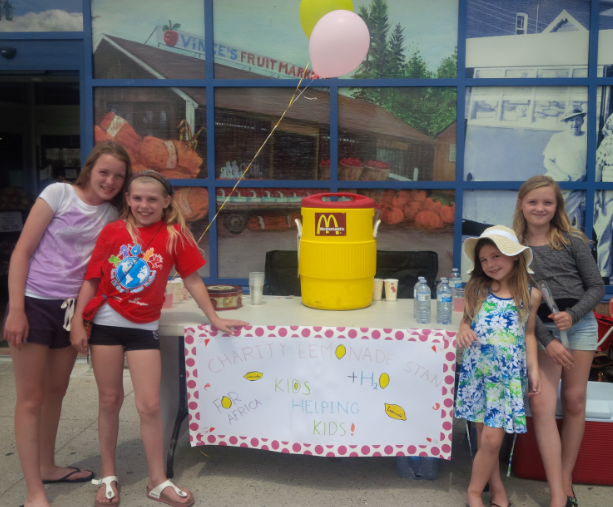 We were fortunate to catch a sunny and hot day – perfect for selling boatloads of lemonade. We spent the morning running around trying to get organized as we only decided to hold the Lemonade Stand the afternoon before. We had much to do – get permission from the grocery store we set up in front, borrow a jug from McDonalds, buy lemonade/water/ice, borrow a table, create a sign, buy balloons, round up some friends and make 36 cans of lemonade! Starting early at 8:00 AM, we were able to pull it all together for a 12:30 start time. The girls were excited, but it was so hot they were soon melting on the sidewalk and the enthusiasm was draining out of them. I called an audible and we packed everyone in the car and drove home to get an umbrella from our backyard. That seemed to do the trick as with the shade, came renewed energy. The girls ended up staying out for 3 hours which is a new record. Even more importantly, we set a new fundraising record. When all was said and done the Lemonade Stand raised $432! We went back home and the girls selected the following gift items from the Plan Canada Gifts for Hope website. The $432 was able to cover all of the above as the Government of Canada matches donations made by the public to this charity at a multiplied rate (2:1 up to 15:1). In total, the value of the assistance sent to Africa was $3,630. On top of that, I was talking about it to one of our major investors and he volunteered to donate $68 to round the fundraising up to $500. The girls are now able to select a few additional items which is very cool. All in all it was a great day with the girls. Hopefully it will help them to think about giving back!